The Swarm is an encaustic mixed media painting. 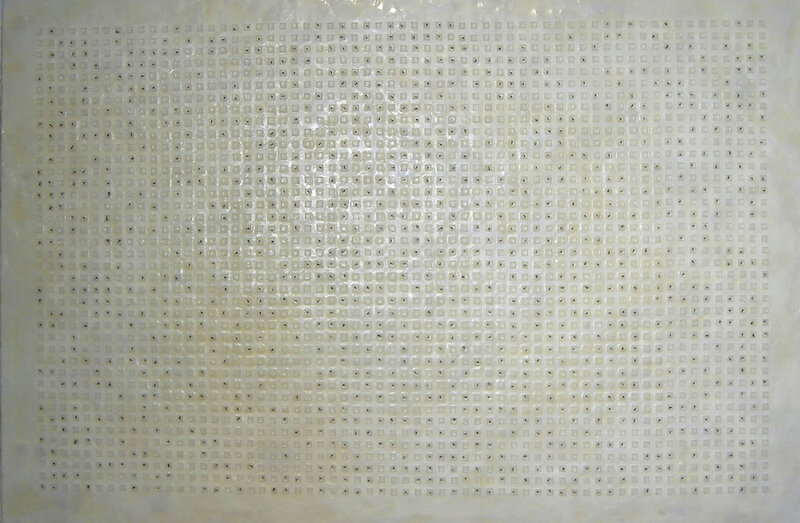 A grid of hundreds of small raised squares in wax rise on its surface, and from a distance, each appears to be decorated with random black marks. Are they scribe notations, or musical notes, or mathematical formulas? It is only as you closely confront the painting that they come into focus—embalmed corpses of mosquitoes, each suspended in a droplet of translucent wax. These mosquitoes are from Whitehorse, Yukon, bagged after being killed in a ‘bug zapper’ and then shipped to me in Toronto. If you stand long enough in front of The Swarm gazing upon the hundreds of mosquitoes do not be surprised if you start to feel a sting on your skin…feel the need to slap the spot…and need to look down. Recall the horror in that moment of slapping: there, on your skin, a squished mosquito in a sea of your own blood. The Swarm was first exhibited in Science Gallery Dublin’s Blood: Not for the Faint Hearted (Ireland) in 2014-15. After that it travelled to Science Gallery London’s Blood: Life Uncut exhibit at the Copeland Gallery (UK) in 2016.